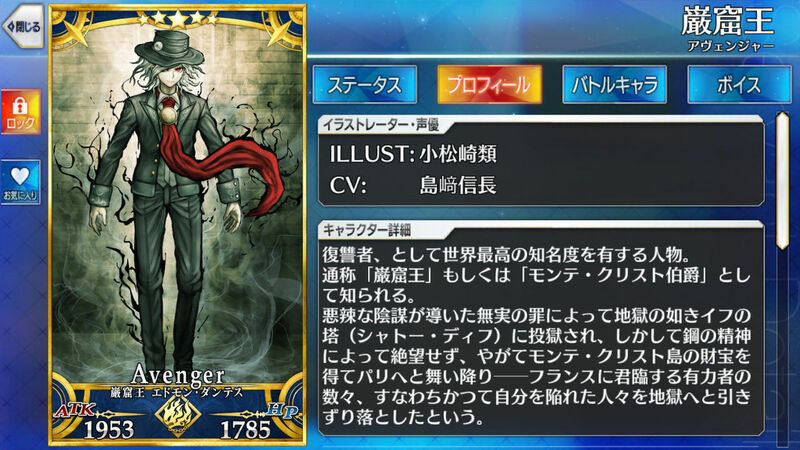 This article contains the stats, strategy, and guide for Avenger - Edmond Dantes. We will update this as soon as the game comes out. Self-Replenishment (Magic) D Gain 3% NP Gauge per turn. Increase own attack for 1 turn. Increase own debuff resist for 3 turns. Reduce one enemy’s NP gauge by 1. “Wait and hope,” he said. This is the line from most famous avenger, Edmond Dantes. Or more popularly, known as the Count of Monte Cristo. Because Edmond suffered against injustice, he had been imprisoned in a tower. Under those false charges, he then suffered life of exile and imprisonment. Since then, his mind had been corrupted. Furious at how the world treated him, he intended to get back at those who dared sentence him. Despite the corruption, he still retains his sanity. But what fuels Edmond the most is his hatred. With hatred fueling whatever ambitions he had, Edmond escaped the tower. As soon as he arrived back in Paris, he changed his name to the Count of Monte Cristo. With that, he blended in. While blending in, he intended to find his targets. The targets all had one thing in common: they all conspired to bring him down. Thus, Edmond picked them off one by one. When he had finally finished the deed, he soon faded away. However, Edmond comes back as a servant of the grail. Because of his hatred and desire for vengeance, he comes back as an Avenger. Or how he styles himself, the “Demon of Vengeance”.